Historical country house in quiet and green surroundings for a holiday characterized by relaxation. A spacious garden with garden furniture, a large panoramic terrace and a forest is at your disposal. In the summer you can pick your fruit straight from the tree. From the panoramic terrace you have a magnificent view over the hills and the coast from Gabicce Mare to Cesenatico. From the other side of the house you have a view on the Rocca of Montefiore Conca. You can eat outside on different spots, on the terrace, under the porch and in the shade of the trees in the garden. Montefiore Conca is a small medieval village with a lovely square where lots of things are organized in summer. 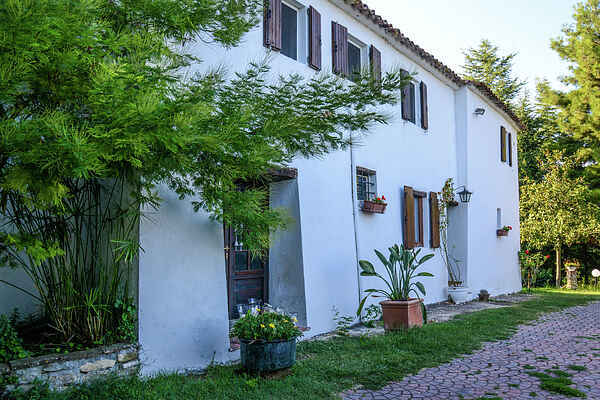 The position of the house is ideal for excursions in the area like Gradara, Urbino, San Leo and San Marino. The coast with its fine sandy beaches can be easily reached in 15 minutes by car. There are also many leisure and theme parks at the coast for young and old. The owner lives on the ground floor of the house. Also your dog is welcome, but not in the apartment. The parking area is securely fenced and there is a doghouse present. The homeowner can provide a delicious breakfast, lunch or dinner in the garden or on the panorama terrace. Typical local products will be used for this. It is also possible to explore the area in mountain bike with a guide. The mountain bikes can be rented nearby, the guide will help you with this. For the children there will be an above ground swimming pool in the garden and a whirlpool for the parents.